Fresh Pasta Galushki Soup (Галушки) are a Eastern European fresh pasta (sometimes a dumpling) which is made several different ways. Mum has always made these in a stew or soup with chunks of chopped steak. Alternatively, the Galushki soup dumplings are boiled in water and served with fried onions and sometimes bacon and homemade sour cream, almost like perogies. They are also made like Slavic gnocchi dumplings made many different ways. A similar dish is Cletsky. So many options from a simple dumpling in so many different cultures! I don’t like to eat them on their own, but prefer them in a tasty broth with chunks of steak (or you can use chicken). Galushki Soup is definitely a comfort food for me, on a cold rainy day. The fresh parsley and fresh dill add a bite of summer to the dish for me. If you don’t like dill and parsley, you can leave these out, but I don’t recommend it. Dumplings are defined as a small savoury ball of dough, boiled, fried or baked. Some people cut the dough uniformly. I pinch small pieces of dough when I add it to the soup. 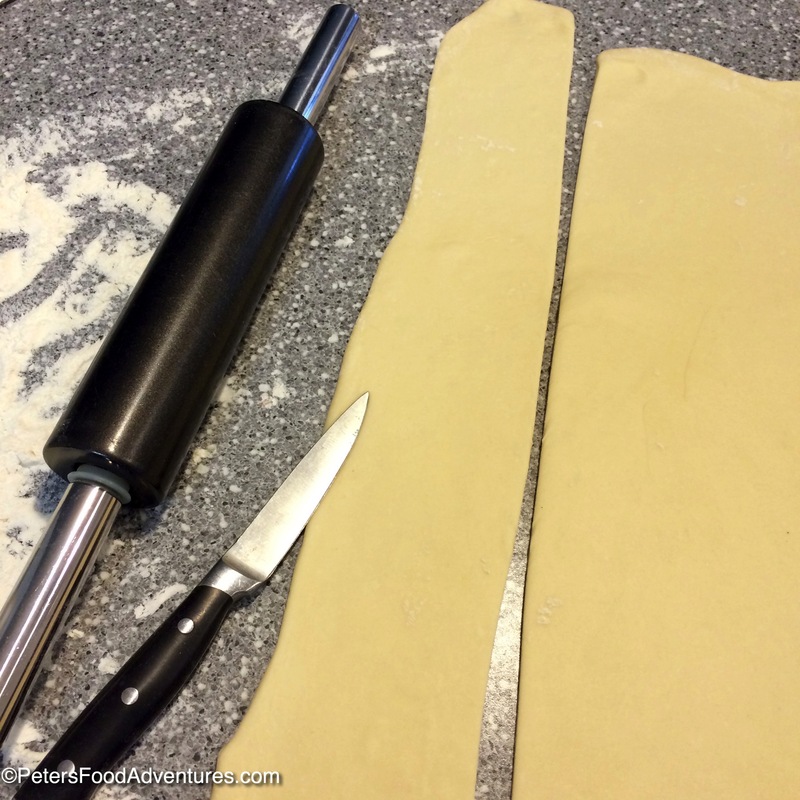 It can be hard to pinch the dough without stretching it long and thin, as the dough is elastic. You need to pinch really hard and fast, without pulling. It’s hard, but eventually you don’t care and just rip the pieces in the soup. Alternatively, you can roll the dough into the thickness of your finger, and dice into pieces. My mum swears that the taste of cut dough, verses pinched dough alters the taste of the soup! She only pinches off her dough as a rule. I can’t personally say that there is a difference in taste, however if you’ve never had Galushki soup, then give this recipe a try, I’m sure you’ll love it! You can decide on how much pasta to add to the soup, I like it nice and thick. I also add Sriracha Sauce to my bowl for a nice spicy kick, with lots of black pepper! I’m salivating just thinking about my Galushki Dumpling Soup. Bon Appetit! Приятного аппетита! Place the flour into a medium bowl. In a measuring jug, crack the eggs and add water. Add 1 teaspoon of salt. Using a fork, mix all together and pour into the bowl of flour. Mix the dough until it's combined into a ball. Dust your countertop with flour and proceed to knead the dough for approx 5 minutes. You might need to add more flour or water to get the consistency right. When the dough has a smooth, semi-hard consistency, cover with a bowl and reserve for later. The dough will soften as it sits. 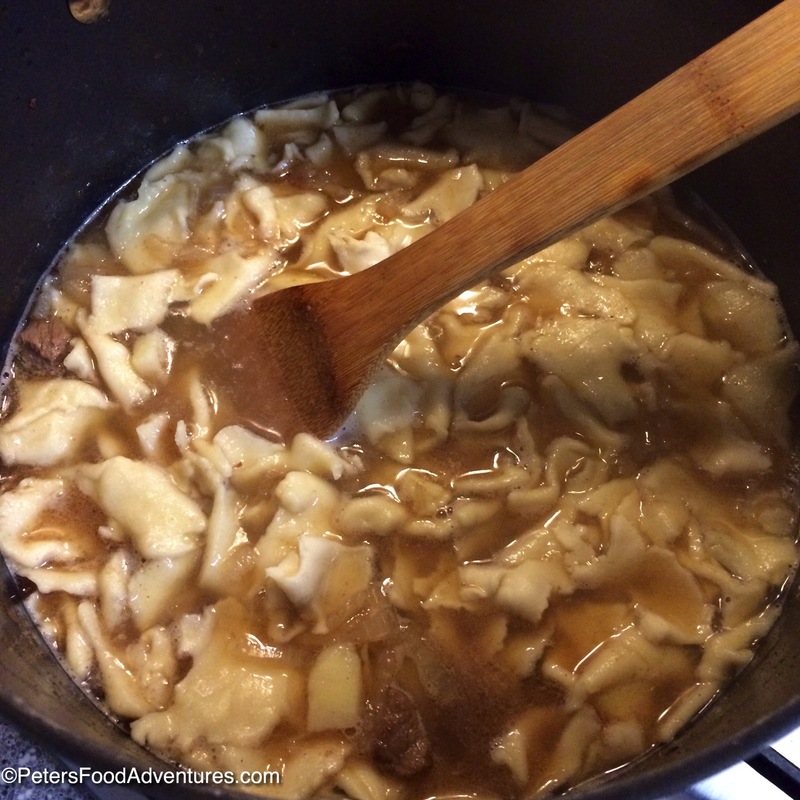 In a stock pot, heat about 2 tablespoons of oil over high heat and add the sliced beef. 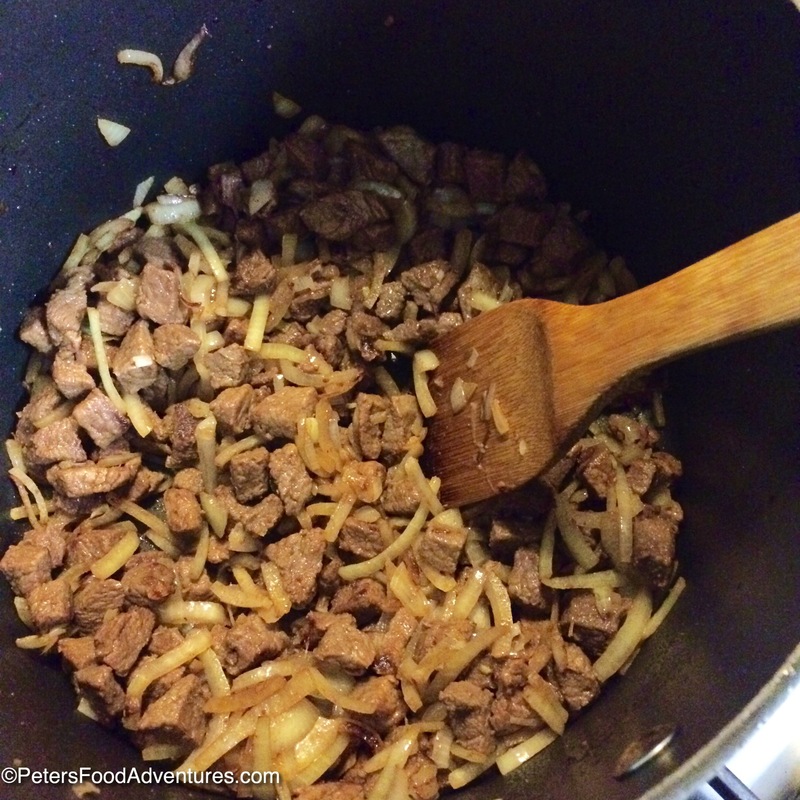 Keep frying on high heat until the water released from the beef evaporates. Now add 1 teaspoon of salt. Keep cooking beef until beef starts to brown. Reduce heat to medium. Add the onions to the beef and cook until the onions are golden brown. Add 12 cups of water, bayleaf, 1/4 teaspoon of pepper, and 1 tablespoon Vegeta. Taste. Add salt to taste. This recipe loves salt. Bring soup mixture to a boil and reduce to simmer for 30 minutes. At the 15 minute point of simmering, add the potatoes to the soup, bring to boil and keep simmering. While your soup is simmering, roll out the dough into a rectangular shape, to the thickness of a pizza base. I cut it into thirds, just so it is easy to handle the dough. You have a few options on how to make the dough at this point. As discussed above, I'm using the pinch method. Pinch pieces of dough of random shapes and place into boiling soup. When the dough floats to the top, its ready. The dough can be sticky, so don't allow pieces to stick together, but put them into the soup one at at time. I rip a bunch on the counter top, then place them into the soup, stir, then add, repeat. Add chopped parsley and dill to taste. Check salt levels, add more salt. Stir and enjoy! Oh this looks just divine! ???????????????????? Looks very tasty and nutritious! Love this… it looks delicious and will be a great project to do with the kids. Thanks for sharing! Oh this brought some lovely memories. My nana used to cook a very similar dish and we used to have it with caramelised onions in butter topped with sour cream or yogurt 🙂 mmmm vkusnyatina! yum! sounds delicious! 🙂 This certainly isn’t diet food is it!!!! this looks so good! It sounds like a fun dish as well! I am so glad I found you…I also grew up on these dishes, and my family history sounds exactly like yours, oh what memories…..I just wanted to say how much I love your blog. I also wanted to say that when my mum used to make galooshki she also used to add some tomato paste into this recipe, so I might try your version but also add the tomato paste….yummm I can’t wait to try it. I am salivating, too. BTW, I think your Mum is right about pinching off the dough rather than cutting. Lol, mums are always right! ???? 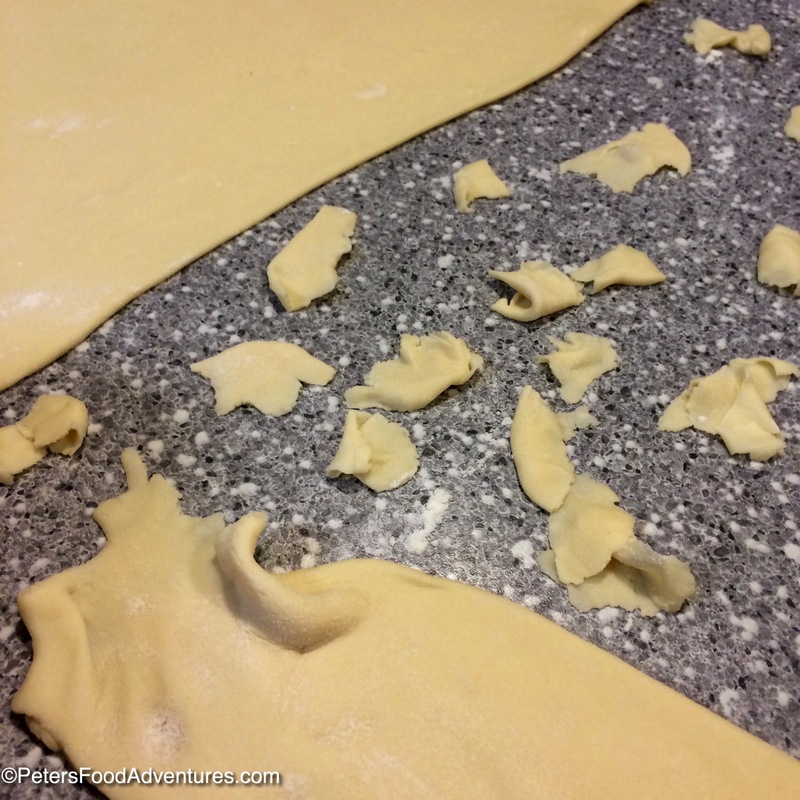 Does anyone on here remember their parents baking pastries….all sorts. Zdobni they were so yummy, and my mum never had a recipe it was all in her head, I have no clue how to make them. As they are a lot of work…you need the right temperature, and consistency. If anyone has a pic/recipe could they please post, спасибо ???? It is such a great comfort food, and yes, we also added a bit of soy and Chinese vermicelli sometimes. It’s the Chinese influence of where they all grew up! Zdobni are so good too. I’m working on it, I have it my mum’s Apricot Zdobni Piroshki things? don’t know what to call them yet, As I said I have the whole recipe photographed, but am having trouble putting her recipe together, as it’s all по глазам- I need to FaceTime her again to get her to do all over again! I’ll post it soon! Zdobna is sure is a lot of work to do, almost becoming a lost art in this instant food world we are living in! I have a much older sister (Coz my mum had 13 kids) who makes zdobni, so I must get her to teach me and film all of it, then edit…..have you heard of Салонина its jars of picked vegitables marinated in a really lovely tomato type sauce even though it’s classed as pickles? Curious to know if your parents ever did this. They did use their home made tomato sauce as the base as well as a mix of vinegar etc….. I remember my mum’s delicious apple pie. She got upset when I asked her for the recipe and said it was a ridiculous question. It turned out she never really measured nor weighted the ingredients, just went ‘by feeling’. haha, yup, it’s hard to nail down a recipe from the older generation! Even when I watch, my mum goes so fast, I say WAIT! How much did you put in? And she says a handful! LOL they can get annoyed when you keep asking for more clarification! Hi Peter! You get your mom’s recipes for сздобное so I can compare to my mom’s which I have worked out the proportions already and it tastes like mom’s baking.